Omega Upsilon was an organization, originally formed by Father Edward D. Kelly in 1909, when he was pastor of the student chapel at the University. He believed that there should be some kind of home life provided for the young Catholic women who attended the University and he realized that a sorority offered such society, friendship, and atmosphere. Unfortunately, however, by the late spring of 1912 membership in Omega Upsilon was low and the treasury was unable to support the activities of the group. By this time, Father Kelly had become Bishop of Grand Rapids, but he retained his dream of an organization which, in ritual and in practice, would help shape the lives of young college women. He enlisted the aid of Amelia McSweeney, an 1898 graduate of the University of Michigan and a woman prominent in educational and civic life in Detroit. 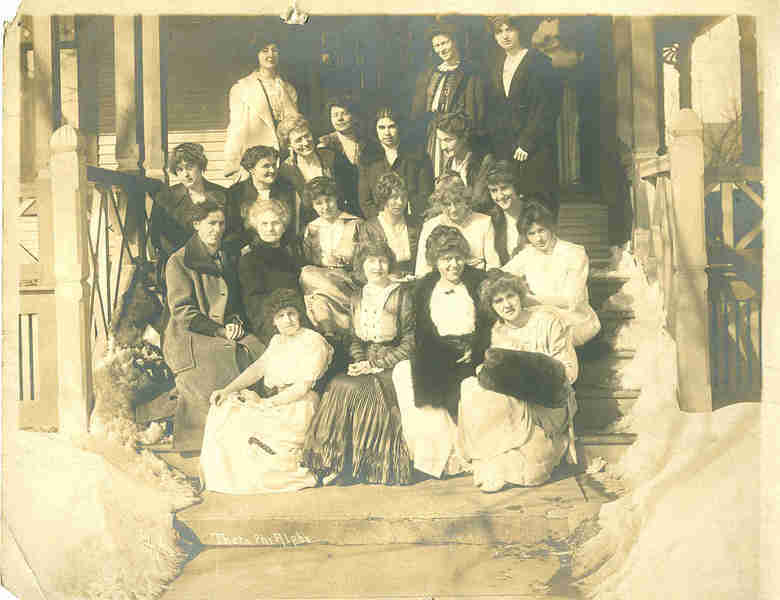 Throughout the summer of 1912, Amelia McSweeney, seven other alumnae, and two undergraduate women worked tirelessly, meeting at the home of Dorothy and Katrina Caughey, to prepare the plans for the new organization – Theta Phi Alpha. May C. Ryan contributed the name, motto, and original coat of arms, and the membership selected the Fraternity's flower, jewels, and colors. Two undergraduate members of Omega Upsilon became members of Theta Phi Alpha. They were Eva Stroh, a sophomore, and Otilia Leuchtweis, a senior, who became Theta Phi Alpha's first Chapter President. Plans for the coming school year were completed on August 30, 1912, and Theta Phi Alpha began operation on the campus of the University of Michigan.